Nine to 27 bottles never looked so good on a wall. 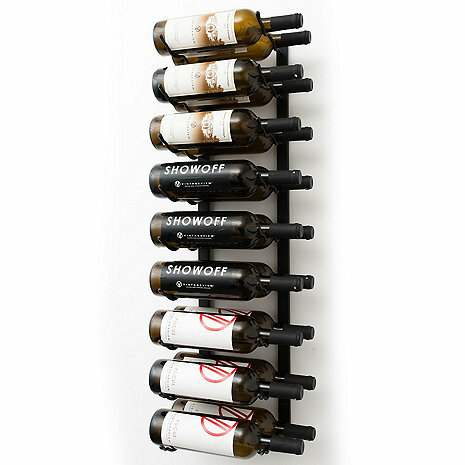 The 3-foot Wall Series metal wine rack is the perfect intersection of form and function. It fits onto just about any wall, with ample height to fill open rooms with contemporary style while maximizing storage potential. This metal wine rack shows off bottles label forward with VintageView's patented system. As with our entire Wall Series offerings, these racks are stackable and may be cut, allowing multiple configurations for any wine room project. Constructed of high-quality steel with powder coated or finishes, our racks are durable, easy to install, and great for both residential and commercial applications. Vintage View wine racks' innovative design allows you to display the labels on your wine bottles while maintaining a proper storage position. These wine racks also provide better airflow than virtually any other racking system, making them ideal for long-term storage and display of your favorite wines. The competitive per-bottle cost and ease of installation with Vintage View wine racks means they are a superior alternative to traditional cork-forward racking. This two bottle deep, eighteen-bottle Vintage View rack is available in 4 finishes.